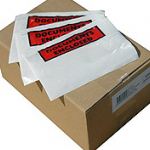 Document Enclosed Envelopes We are one of the UK's largest suppliers of document enclosed envelopes. Our brand is manufactured in the UK for superior quality. We stock a full range of sizes in both "printed" and "un-printed"
We are one of the UK's largest suppliers of Document Enclosed Envelopes. Our brand is manufactured in the UK for superior quality. We stock a full range of sizes in both "printed" and "un-printed" A3, A4, A5, A6, A7, DL. We will beat ANY UK Price for Documents Enclosed Wallets or Pouches. Call 01268 768 Now.